Posted on February 9, 2014 by Ching under Events, Travel, Zumba. Day 3 consisted Aqua Zumba training. Yes! I am finally licensed to teach Aqua Zumba. Finally! I really wanted to get my Aqua Zumba at the 2013 Zumba Instructor Convention but the training sessions were full by the time I registered. I’m so glad I was able to get in the training this time around. Here’s a photo of me with out instructor Caroline Parsons. 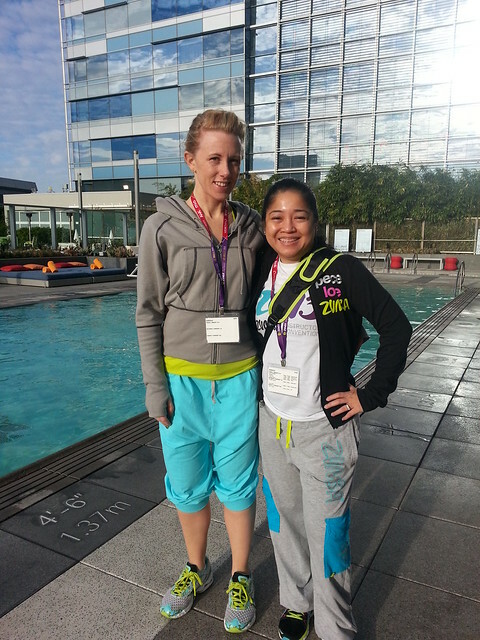 She is the new lead Zumba Education Specialist (ZES) for the Aqua Zumba training program. As they say, things happen for a reason. I never did catch Beto at the convention last year but this time he actually got in the pool and took the Aqua Zumba master class with us. What at treat! Not only did I get a photo with Beto, I got photo with Beto with his shirt off! 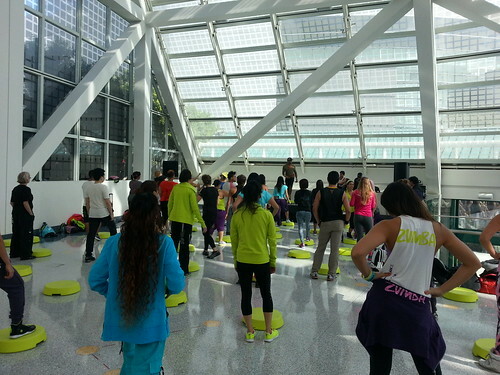 I caught a glimpse of the Zumba Step demo during our lunch break. I was too late to participate in it, though. I think I’m going to ask for the Zumba Incridible Results DVD set this year for either my birthday or Christmas because I doubt that any of the gyms here in town will pick it up. It’s just too much like other existing group exercise formats. At least, I don’t think the YMCA will offer it. Oh, and guess who I ran into while I was watching the Zumba Step demo. None other than the handsome David Velez, of course. You might recall him from my post about day 2 because he helped Steve Boedt with our Pro Skills training. Besides photos with Caroline, David, and Beto, I also got a photo with Richard and Jill from the Aqua Zumba team. Actually, practically the whole Aqua Zumba training team was there on Sunday afternoon. I wish that I could have gotten a photo with all of them.